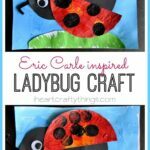 My little girl has been enjoying this Eric Carle book this week so we decided to create some art to go along with it. solved is a joyful surprise. 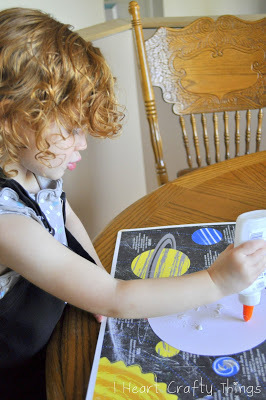 To make our Eric Carle inspired art project, we started by painting the background for our moon on a white sheet of cardstock. 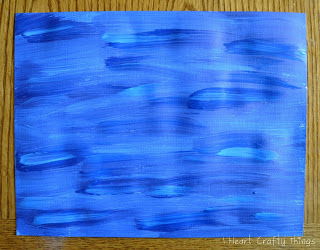 I put a dollop of dark blue and bright blue paint right next to each other on a small paper plate and we swirled it a little and painted our entire sheet of paper. While our background paper was drying, I cut out a large circle from of another sheet of white cardstock paper for our moon. 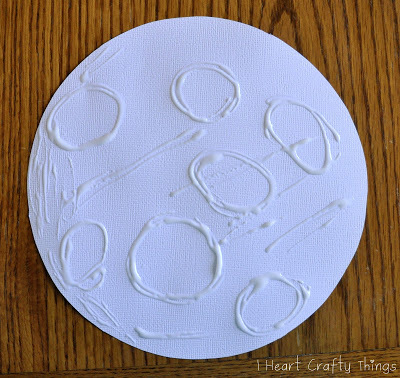 Using school glue, we drew circles and lines all over our moon to act as craters and texture. 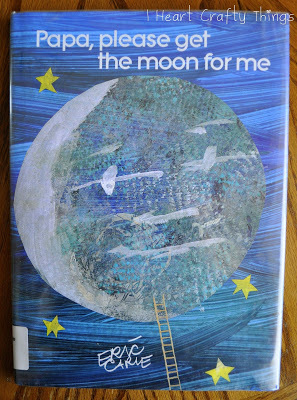 If you look at the cover of the book, the moon actually looks like it has a face on it, so you could make a face with your glue instead of circles. You will have to let your moon dry completely before moving on to the next step. 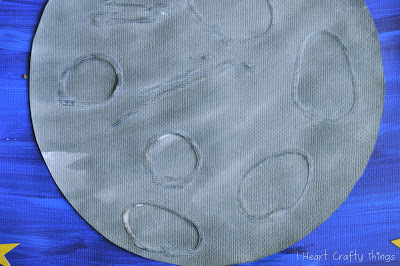 After the school glue was completely dry and translucent, I diluted some black liquid watercolors with water (to make gray), and we used it to paint our moon. You can see how the school glue creates a texture on the moon. It is really neat looking and fun for the kids to touch and feel. 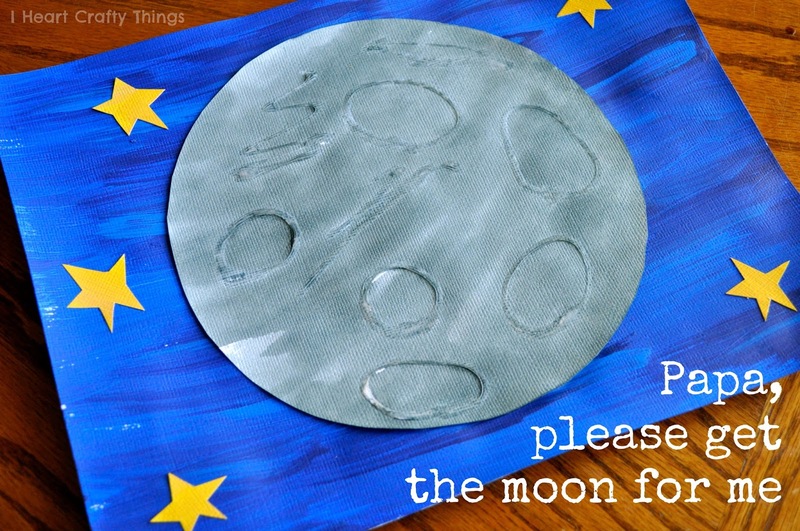 After your moon is dry, glue it onto your blue background. 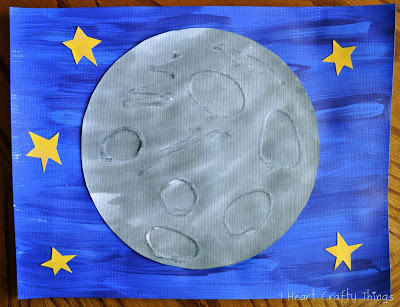 We decided we wanted to add stars like in the book, so I ended up painting a piece of our scrap paper (from the moon) the same way as the blue background, but with yellow and a light skin tone color. 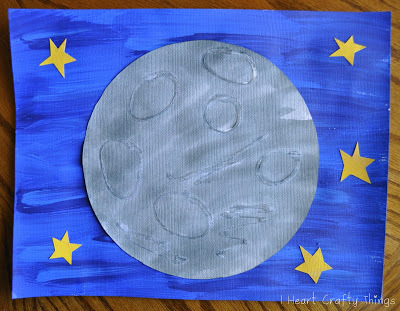 After it was dry, I cut some stars out reminiscent of the book and we glued them on to our moon artwork. You probably could just use yellow construction paper or cardstock paper if you were in a hurry to achieve the same look. 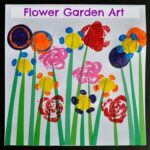 There are several different steps to this project and some waiting time between each but each step was fun for my toddler so the waiting wasn’t a big deal at all. You could break down this project into a couple days during a solar system unit. I love this craft! I am pinning it! Thank you so much for sharing this amazing work. Love the texture of the moon.